If last year’s Deer Shed was the impeccably-behaved child who eats with their knife and fork and never speaks with their mouth full, 1 year on that same child is bigger, a bit more difficult to get on with, but still manages to bring joy in virtually unlimited quantities when they’re on their best behaviour. The first signs of growing pains come when we are introduced to a brand new parking field, easily doubling the distance ‘twixt vehicle and pitch. Still a modest trek in comparison to some, but the extra luggage distance is a sure-fire recipe for sore arms. The new field was needed because the camping areas have been enlarged at the expense of parking spaces, meaning that there’s almost too much camping space: there’s acres of room, so nobody has to camp near anyone they don’t want to. On Friday, the dulcet melodies of Happyness (of whom more later) and Honeyblood (a brilliant two-girl Scottish duo of various grungey textures) spill on the gentle breeze as we have line-of-sight of the main stage from the campsite: such luxury!) 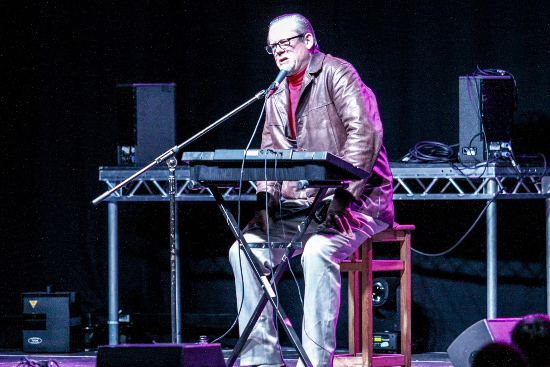 But by the time airbeds are firmed, John Shuttleworth is the unanimous choice for first act in person. His deadpan delivery is spot on, as always. The “soundcheck” joke deserves to be repeated at stages across the land, and in his delivery of such postmodern classics as ‘Two Margarines’ and ‘I Can’t Go Back to Savoury Now’ live the ghosts of such diverse entertainers as Les Dawson and Fred Dibnah. Kids are dispatched, and it’s time to finally see Teenage Fanclub live after many a year of listening to them on record. I believe they were alive, just, although from the one-dimensional dynamic built from the same metronomic handful of chords played in slightly different orders, it was difficult to be sure they were fully awake. The breathless fanboyism of Deer Shed’s own review tells a different story, but let’s set the record straight here: unless your idea of fun is watching the result of an accountants’ team-building session shuffling around a stage, stick to their recorded oeuvre. This was mentioned back in 2015, but it bears repeating now: presumably in an effort to swell the audience for a headliner who needs such assistance, there is nothing scheduled elsewhere on the site during the final main stage band. There was little point in escaping Fanclub so they received the benefit of the doubt and a full viewing in case they got going a bit towards the end (they didn’t). The Obelisk tent is Deer Shed’s traditional late-night party venue, and it kicks off just after the headliners finish around 11 o’clock. Revellers flock there to continue the party, in the hope of a fresh beverage and some tunes of increasing intensity. Someone faffs around with a mixer for ages and finally, well past midnight, some danceable music comes on. Nothing special mind, just an indie disco basically, but it’ll do. They say you make your own entertainment, however, so meanwhile all number of just-about-remembered faces from festivals gone by are reacquainted, along with some new ones (shout out to Jen, Billie, Alex, Chris, Neil… and all those others whose names I’ve forgotten), so a night in the Obelisk is always memorable. But please, Deer Shed, can you schedule something upbeat every night as soon as the main stage ends? Many thanks. It still hadn’t rained as I crawled into bed. As the months of the smaller festivals are now upon us, it’s time to look at which are worth going to. We’ve already given you the lowdown on The Great Escape, but there’s another one that is equally as worth your time. Dot to Dot Festival, which started back in 2005 in Nottingham, is now a 3-day touring wonder. There’s the main festival lineup, a plethora of bands playing over the 3 days in the three different cities – Manchester, Nottingham and Bristol – plus local acts making each day’s lineups unique. Metropolitan festivals are still on the rise as people look to cheaper options for that “festival feeling”. The giants will always be giants, but the smaller festivals tend to be gems that appeal to those who can’t afford £200+ for a weekend away. Also on the rise are touring metropolitan festivals. Taking their lineups around the UK to strategic North, South and Midlands locations to give everyone a chance to catch their show, but the fact Dot to Dot makes sure to specifically highlight local acts, making them a first of their kind. Heading up this year’s core festival lineup are Sundara Karma (pictured at top at SXSW 2017), who released one of the debuts of the year back in January, ‘Youth is Only Fun in Retrospect’. Powerful, contagious indie rock filled with spirit, the group led by Oscar Pollock are a necessity for not only the new generations but the old. 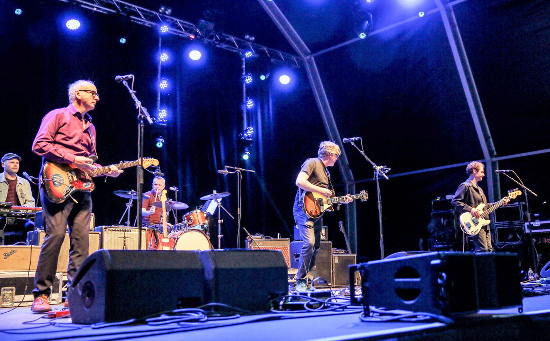 They’re the quintessential festival band you need to see. Another band you can catch on all 3 days of Dot to Dot are Scottish indie duo Honeyblood. Having released their highly-anticipated sophomore album ‘Babes Never Die’ at the tail end of last year, they’ve been on tour since and they’re simply captivating live. So far, so good: Dot to Dot seems to be delivering well on its lineup. It would simply be rude to not have a deeper look into these local acts. It’s a rare opportunity for a fairly large chunk of the respective music scenes to come together and show off their homegrown talent. There will always be a strong, vibrant music scene in Manchester. Its musical history is quite literally littered with iconic names and faces that are known throughout the world, but who’s stepping up to the plate and coming up the ladder? The name highest up the bill for the local bands is The Slow Readers Club, and it’s easy to see why. Everything about their sound is Mancunian, from the dazzling indie guitars to the marching beat that echoes back to Joy Division. You’ve also got PINS, the punk foursome who are kicking asses and taking names, especially with their latest release, ‘Bad Things EP’ that features none other than punk godfather Iggy Pop. None too shabby, eh? Another one of those spots around the UK where creativity shines. Filled with a surplus of differing genres and talent songwriters, Bristol has a pretty special lineup, and one of those names is Willie J Healy. Crafting indie pop songs that are filled with his quirky mind workings, Willie is one of the brightest new names coming through the ranks. Van Zeller is an even fresher band, but they’re slowly taking over the DIY live circuit down in Bristol. Raucous and riotous: two of the music’s most important aspects. Perhaps not quite the same musical melting pot as the other two locations, though it certainly has had its moments, Nottingham has a few treats in store in its lineup that are definitely looking to change that mindset. Kagoule have been making a few waves in the British scenes for a little while now, their debut came out back in 2015, but it’s still as fresh as it was then. Though he’s not actually Nottingham based, Tom Lumley is a name that needs to be mentioned, plus he’s on the Notts poster. A songwriter from Cambridgeshire, his tracks are as new as they are old. Flavours from the rock spectrum dot his songs, bringing out a modernity that’s often missing from other artists, so his repertoire doesn’t feel. So there you have it. 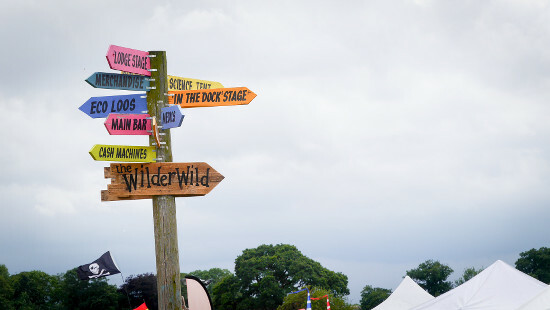 A brief glimpse into the wonders that await the landscape of the UK with Dot to Dot festival. Go forth and roam the country with some bright newcomers and find some local talent. Tickets are still available for all 3 days of this festival, which stops in Manchester on Friday the 26th of May, Bristol on Saturday the 27th and Nottingham on Sunday the 28th. Before booking fees, Manchester tickets are £12, while Bristol and Nottingham’s are £20 each, a real bargain. Buy your tickets through here. Editor Mary Chang contributed to this preview. Scottish girl rock duo Honeyblood released their newest album ‘Babes Never Die’ last November on FatCat Records. The LP includes the robust track ‘Sea Hearts’. which we featured in this previous Video of the Moment feature. The girls have now released a special behind-the-scenes video for the title track. It gives us a sneak peek into what goes on when they’re on tour. It’s a nice balance between what happens in the interim time between gigs and the press released described “raw intensity of their live show”. Watch it below. For more of TGTF’s coverage of Honeyblood, go here. Scottish girl duo Honeyblood are gearing up to release their second album at the start of next month. ‘Babes Never Die’ is scheduled for release on the 4th of November on Fat Cat Records. One of the early tasters from the upcoming album revealed to the public was ‘Sea Hearts’, which now has its own promo video. It starts ominously enough by the sea, where a female-looking creature comes out of the lagoon. ‘She’ tries to assimilate into society, in this case a costume party where her strange behaviour actually fits in better than any other social situation. Will her cover be blown? Will this end well, or in tears? Watch the video for ‘Sea Hearts’ below and find out. For more of TGTF’s coverage of Honeyblood, including another early taster ‘Ready for the Magic’, follow this link. Scottish girl duo Honeyblood have returned and with a bang. The promo video for ‘Ready for the Magic’ chronicles the crazy, uncouth life of farm kids who have a penchant for, er, burning things. Being a Honeyblood song, it’s a swift kick in the arse and entirely welcome in its energetic delivery. It’s a great first taste of their second album, which is expected later this year. We’ll let you know when we hear more. For more coverage of Honeyblood on TGTF, go here.